Our peppy Dancia rental car, parked at an overlook to the town of Yate, New Caledonia, in the Grand Sud. 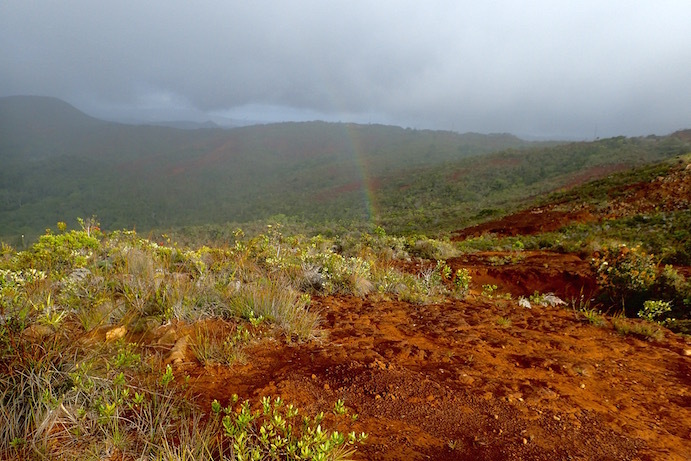 Theoretically, our day trip to New Caledonia's Great South (Grand Sud) was a complete failure. Fortunately, we found it to be a delightfully, fabulously serendipitous failure. 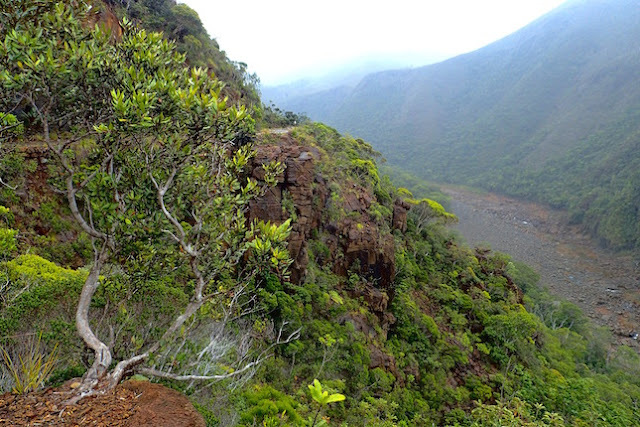 "Why is hardly anyone hiking these awesome trails?" we asked Fred and Rick, who we met on a portion of the GR1 trail in Prony Bay*. They write "The Cruising Guide to New Caledonia." "They go to Rivere Bleue," we were told. 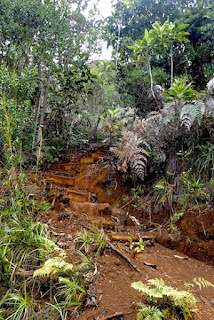 *watch for a post on Prony and its excellent trail system coming up soon. 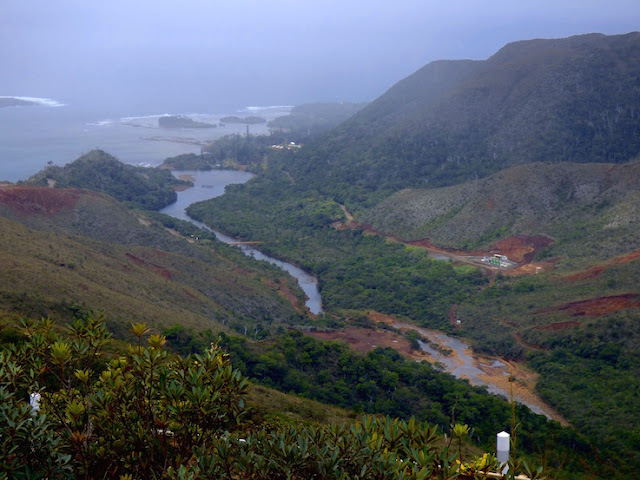 View from Yate overlook, Grand Sud, New Calendonia. Where was Yate Dam?!? How could we miss it? Well, we figured, if Rivere Blue is more popular than these trails, they must really be worth checking out. 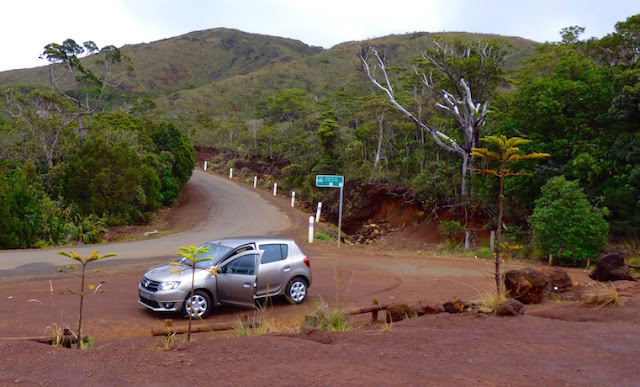 Given we also planned to rent a car for several days to explore New Caledonia's North Eastern Coast, we decided to rent a car for a week and start with a day trip to South to Parc Provincial de la Rivere Bleue. One of the travel references I read mentioned reservations to the park were required. 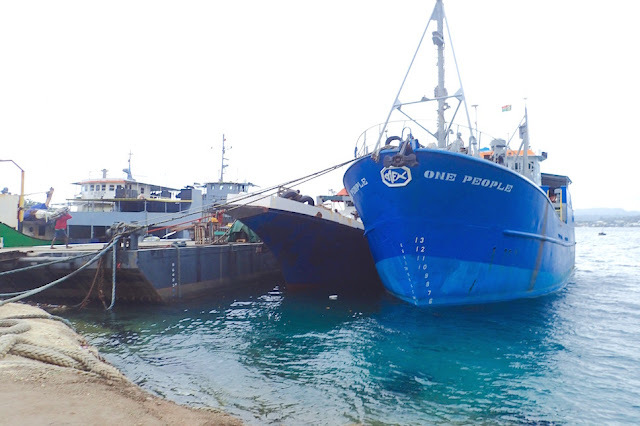 Finding that odd, I checked with the Visitor Center in Noumea, who assured me reservations were not needed. Our car rental was on the heels of a holiday weekend, so we got a bit of late start waiting for a car to be returned and readied for rental. We rented from ADA as we learned from Chris and Chris of Scintilla ADA offers international travelers unlimited miles at their regular rate. Matthew of ADA spared me my shaky rudimentary French thanks to his 6-year stint in Australia. Steve and Patty of Armagh joined us for the ride. it was a bright and sunny day - perfect for a road trip. 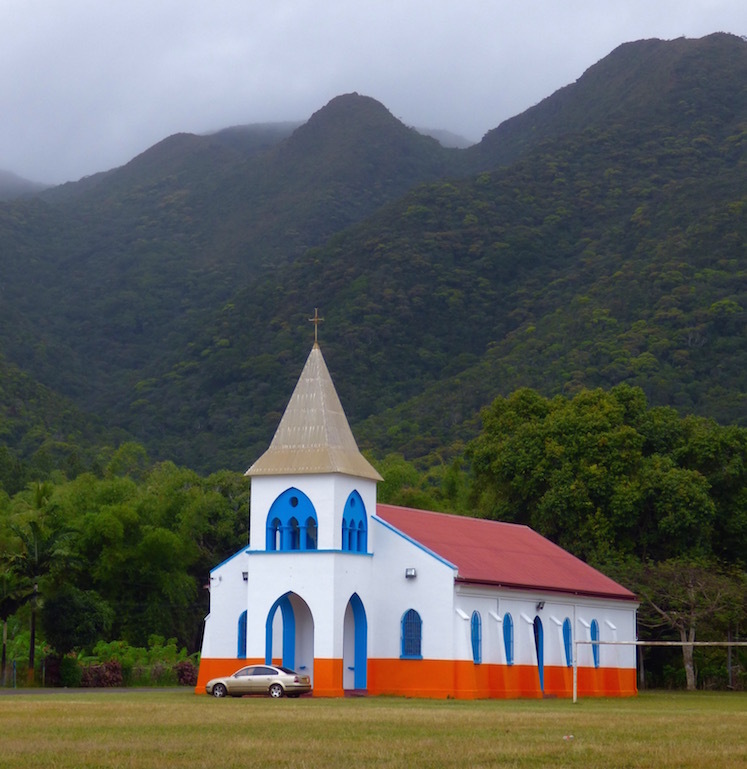 The gray day made this gaily-colored Yate church "pop." New Caledonia. We expected the drive there would take about 1 1/2 hours. Once we navigated the maze of exits branching away from Noumea (kudo as usual to Patty, an exceptional navigator), we relaxed. The road choices simplified and we practically had the road to ourselves, and an hour still to drive. 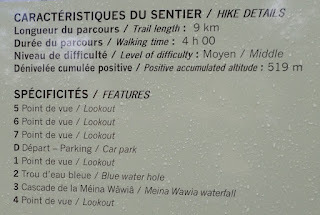 Eventually, we found ourselves at the entrance sign to Parc Provincial de la Rivere Bleue. Then I noticed the sign said "Overt Mardi au Dimanche" (Open Tuesday to Sunday). We were there... Monday! What kind of park is closed any day of the week, we wondered. So we drove a bit further... until we reached the park's tall locked gates. Steve checks out the map outlining the Yate hiking trail. We still hadn't found the dam. Grand Sud, New Caledonia. Also on our agenda was checking out Yate Dam. 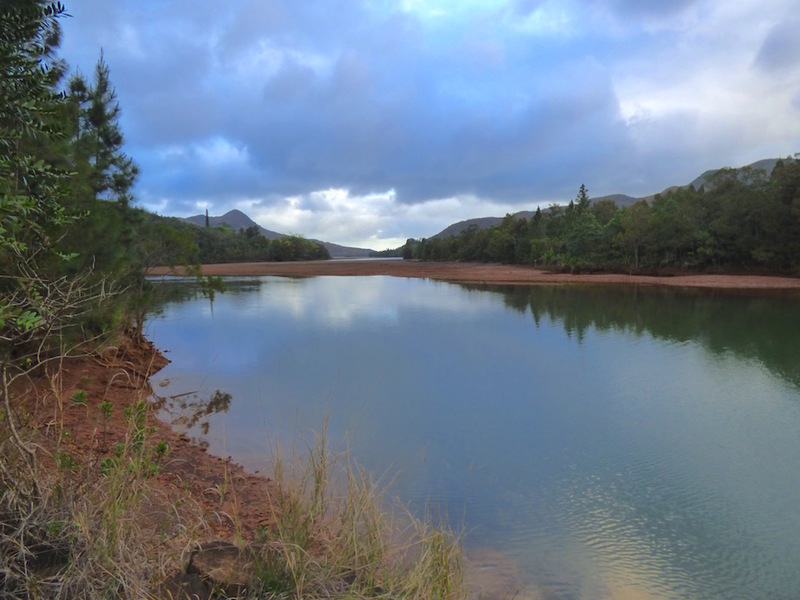 The park was located adjacent Yate Lake, so we decided to follow the road and see if we could find the dam. Meanwhile, the skies clouded up, and a fine mist began to fall. Yate hike details, in case you're in the neighborhood. After following the lake, we found ourselves heading up into the hills, taking in a few overlooks as they came up. We discovered Prony's dramatic red-orange landscape was prevalent through much of the rest of the Grand Sud. Eventually, we found ourselves in the blink-and-you'll-miss-it town of Yate. We spotted a road that looked like it led to a beach. It passed a church, with parking near a few buildings by the shore. A delicious smoky food scent wafted out of a long communal building. I was hoping to try out the Caledonian version of earth-baked food, baugna, having tried similar versions in other South Pacific countries. To my disappointment, the food was not for sale or general public consumption. Waterfall sign? Nope! Rockfall warning! We retraced our steps in search of Yate Dam. Meanwhile, Wayne found the dam's power house. He followed the road beyond the power house until the road was gated off. At this point, it was pretty misty-wet outside, so we broke out our picnic lunches and ate in the car near the road block. Again, Wayne's curiosity prevailed. With the rain lightening, he wandered past the gate bit further down the road, and discovered a great viewpoint. After we finished lunch, at Wayne's urging we too wandered up the road to see the viewpoint. Breath-taking view from the Yate trail pullout above the Yate dam power house. New Caledonia. In fact, in a fairly short span there were multiple lookouts. The first showed a broad river snaking past the powerhouse. A bit further, there was a deep ravine opening out into a narrow canyon valley. 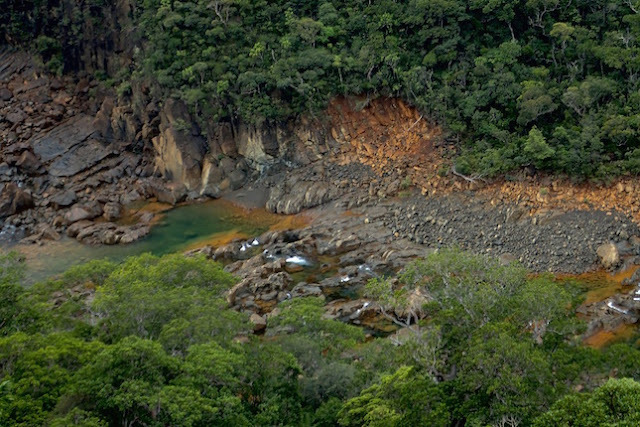 There, while the water slowed to a trickle, comparatively, there were small cascades and a lovely emerald green pool. Ravine overlook from road past Yate Dam powerhouse. We thought we'd see a waterfall from the viewpoint, and while there probably was one or more, we'd thought it because of the artfully rendered sign at the road close. 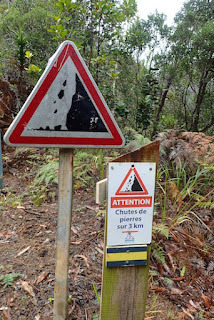 We surmised what we thought was a waterfall sign was more likely a rock fall warning sign! Did I mention that limited as my French vocabulary is, Wayne, Steve and Patty's was even more so? Thanks to a 60x zoom on my camera, this lovely emerald green pool down the ravine was revealed. Grand Sud, New Caledonia. We checked out the hiking trail sign we're guessing dovetailed with the road. 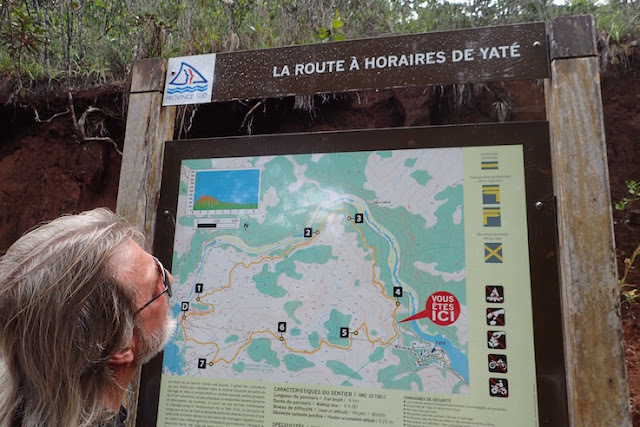 If we had a do-over, and a sunnier day, we'd love to spend the half-day hiking the trail, La Route a Horaires De Yate. Again, we retraced our steps, pausing to ogle a pair of metal water pipes so large it likely would've taken all 4 of our arms fully outstretched, touching fingertip-to-fingertip to embrace one of the water pipes. Wayne resumed his determined search for the dam. This time, when Wayne saw the little brown sign stating "Barrage," he correctly guess that meant the dam. 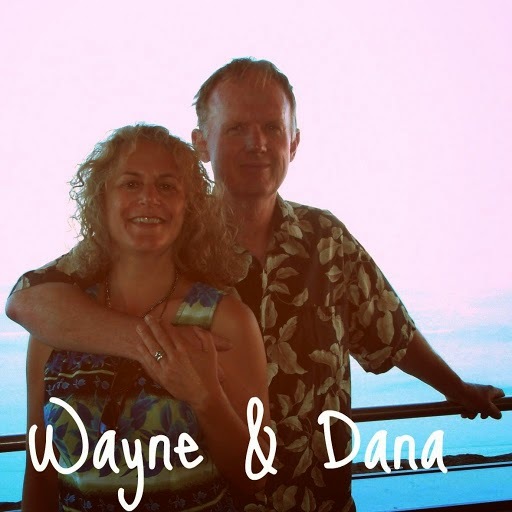 Wayne's persistence paid off- he found it! And we were happy to be along for the ride. Yate Dam spillway, New Caledonia. It appeared prior public dam observation areas suffered enough erosion, the access to view the dam was moved further back, behind a tall chain link fence. 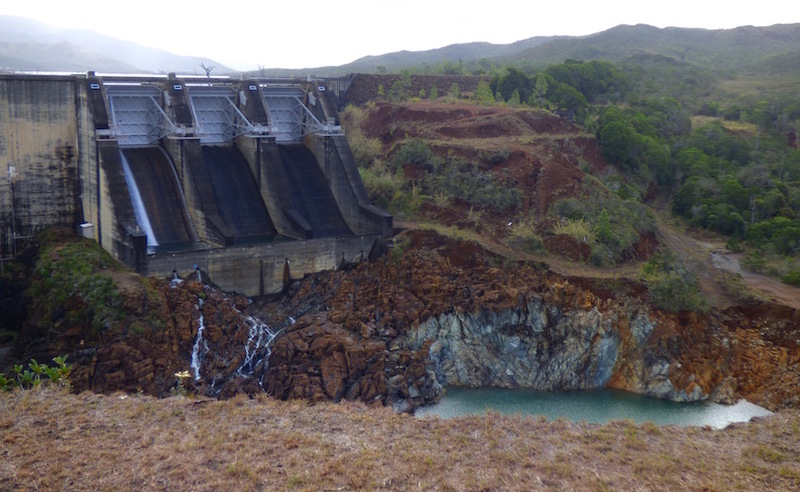 The water flowed thinly, over only one of the dam's 3 chutes. 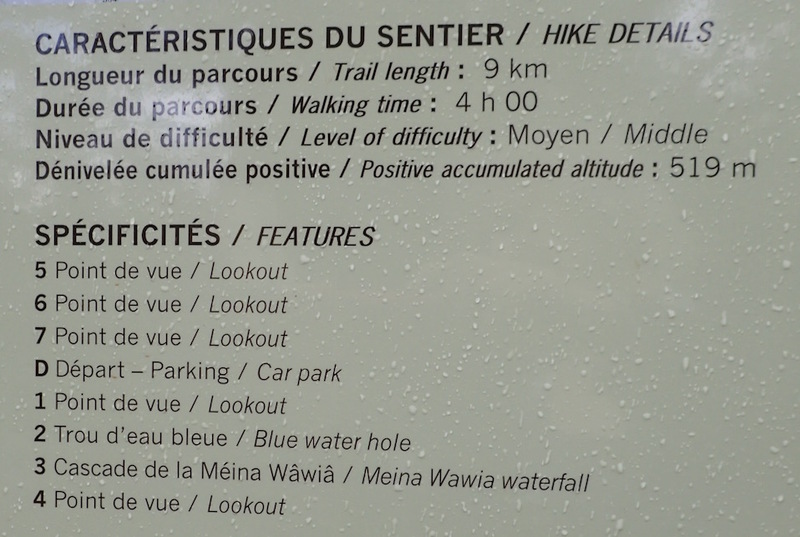 Next we sought out Chutes de la Madeleine, a waterfall attraction in the area. We found it, even walked up to the entry booth, but again the rain put a damper on our hiking interest. Given our sunny start, none of us brought our rain gear or even our umbrellas. Besides, Chutes de la Madeleine was a paid attraction, and we kind of wanted to be back in Noumea before dark and we were well into the afternoon. We pushed on. 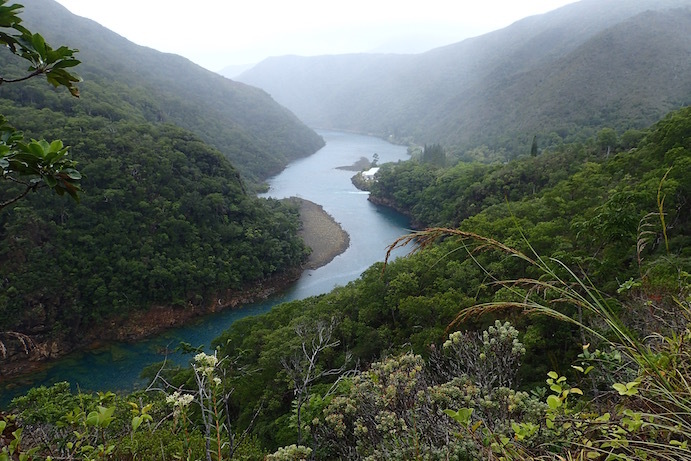 Wayne continued out on an alternate return path through the hilly countryside, over the curvaceous roads to Noumea. Wayne on the terra-cotta colored saddle of a territorial lookout in the Grand Sud, New Caledonia. Eventually, we reached a crest with tell-tale Prony-red dirt steps leading to a lookout. It even had a little tower. In the distance, Prony Bay glimmered white in the late afternoon sun. It was that magic hour, when the light suffused the surrounding hillsides with a golden glow. Droplets of mist teasingly dappled the air briefly with a soft rainbow. As if the scenery wasn't gorgeous enough, out popped a rainbow! Grand Sud, New Caledonia. We knew the time was short to make it back before dark, but still couldn't resist one final stop at a bridge crossing the Pirogues River, its calm surface reflecting the faint early blush of the upcoming close of the day. Half hour later, without too many missed turns, we were relieved to find ourselves at Moselle Marina's dinghy dock before dark. Periwinkle clouds, reflected on the glassy Pirouges River surface, Grand Sud, New Caledonia. If Blue River Park had been open, who knows what we might have missed? Far from feeling like a failure, we were pleased with our full day exploring New Caledonia's Grand South, and even more excited about our multi-day trip starting the next day. Success - sometimes it's simply a matter of perspective! Yate trail. The path note taken - yet! We plan to catch a weather window - likely in this next week to Australia, about a 1 1/2 -2-week 750+ mile passage. Meanwhile, there's some prep and we plan to make a few more cruising stops in New Cal before we give our final goodbye to this lovely country. Then we'll cruise in Oz, travel and figure out where to go back to work somewhere in the world.